While at a training for missionaries preparing to go on the field, I’ve had some time away from the regular demands of life and have been able to really process life. We are starting a big transition. We just sold our house. We’ve sold a lot of our possessions and plan to sell a whole lot more next month. We are getting ready to move over 6000 miles away from the family and friends that we love. We are going to be completely out of our comfort zones in nearly every imaginable way. I am super sad about this move. I am really grieving the losses for myself and my kids. I am at this training for a few weeks, but then I will go back and really begin the hard work of saying goodbye to life as I’ve known and enjoyed it. Sometimes, I can barely breathe under the weight of it all. 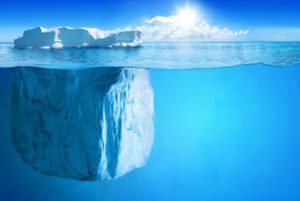 I am now only dealing with the tip of the iceberg; there is so much hidden beneath the surface. And yet, I am totally at peace. I’ve been doing the hard work to prepare mentally and physically and now I’m starting to really prepare emotionally as well. It isn’t all sunshine and roses, but it is all beautiful. Maybe even more beautiful in the deep sadness that is surrounding me as I reach out for help. God is my ever-present help (Ps 46) and so I need not be afraid. Even in the sadness, I can see God’s with me – his love quieting me, helping me to take the next step forward. I am a girl with many questions. I am also a girl who likes to have all the answers. Unfortunately, I am in a really uncomfortable place for me… a place with many unknowns and therefore lots of potential for growth or failure. Failure is my biggest fear. My husband and I have known for a while that God was calling us to go, to serve full-time in ministry. We have been following God’s lead, one step at a time. Last September, when I began the Revelation study with Bible Study Fellowship International (BSF), I was praying for a revelation of my own, where God would answer all my questions about the future. Well, God has made many things clear in this study of Revelation. For me, the biggest revelation has been Jesus! This study has been a Revelation of Jesus first and foremost. If I have all the answers, I will rely on myself, but God has opened a huge door and called me, my husband and our three kids to go to Yaoundé, Cameroon – francophone Africa. That was one question answered, but it led to so many more questions with so much potential to fail. Every moment, I have to make a choice: will I freak out because the circumstances around me are far beyond my abilities or will I look at Jesus and trust Him. Revelation has made me focus on Jesus. Each week at BSF, I’ve learned lessons about God’s sovereignty and power to control everything. Jesus is worthy of praise and complete trust too, even in the midst of seeming chaos. Jesus is victorious, king, lamb, lion, sacrifice, worthy, faithful, true, mighty, perfect, bright morning star, holy, above all, reigning, powerful, just, merciful, living, gracious, beckoning… and so much more. As a children’s leader, each week we ask the kids questions after the story. The kids know that the answer is Jesus. We ask: Who is perfect? Jesus. Who judges rightly? Jesus. Who reigns in heaven? Jesus. Who is coming again? Jesus. This is what I needed to be able to understand the book of Revelation. It isn’t about all the symbols and judgement, though that is in there; it is about Jesus. The very first week from lecture, I wrote down: “Follow God’s dreams, not mine. Don’t focus on what ‘seems’ to be, but on Jesus.” What seems to be is not always what is… It seems like I am in this awful place where I feel so lost and out of control. I am full of fear. I am overwhelmed and failing as a mother, wife, friend, missionary, children’s leader. I see how I am not measuring up and it seems so hopeless. I am working hard at developing a partnership team and obeying God’s call, and I am tired, but in my weakest moments and when I keep messing it all up, God keeps picking me up and calling me back to Him. God wants me not to focus on me, but on Jesus. I dream of being perfect and having everything just so. God’s dreams will get me there one day, but His dreams are taking me a different way than I’m inclined to go. So, the biggest lesson I’ve learned was stating succinctly in the intro to this study, and then repeated each week. “Keep your eyes on the Lamb!” When I have my Jesus in sight, my doubts and questions lead me to worship, not worry. With Jesus in His rightful, central place (Rev. 5:6), I say “Yes, Lord” no matter the cost and am able to take the next step forward in faith, not fear. I can see that the wild place (Rev. 12:6) may really be the safest place because that is where Jesus is. It seems so hard at times. But then, I look at Jesus and I see all that He has done, eternally, for me and I see Him at work, here and now in the little details. My kids are sharing their deep thoughts openly and asking for prayer. My husband is talking to strangers and friends alike, confidently – if you know him, you understand that this is a huge God-act. Our financially partnership team for our Wycliffe ministry is at over 60% and that is God’s work. I am humbled to be part of what He is doing. God has brought me from not knowing where or what He was asking me to do last September – to clearly calling me and my family to Cameroon in December, to providing what I need, at exactly the right moment for His glory now. I am often full of tears and fears, but God is so gracious and I’m learning to trust Him each moment and to focus on Jesus, following His dreams not mine. I don’t like being in this uncomfortable place, not knowing all the answers with great risks, but I know Jesus and with Him, I can take the next baby step. I can be bold and look at Jesus. As I confess my self-focus and repent, my focus changes to Jesus. Jesus is the answer for life and for all my questions too! You won’t be surprised to hear that change can be good or bad. Well, I was ready and even excited for a change in my life. The shock of my new hair was really, well, shocking. My children were not fans of my new boy haircut and I wasn’t really sure how I liked seeing so much of my face – with the signs of aging that have somehow appeared just recently, because they weren’t there the last time I looked. That small change took some getting used to and now my kids actually like my hair and recognize me when I come to pick them up. I usually love the new year and the promise of a fresh start. I feel the same about each new day. I often encourage myself by reminding my kids as I tuck them into bed that we get to start over fresh tomorrow. This new year has brought a few changes that are taking some getting used to, just like my hair. One of those changes, is actually not a change at all, but a return to our normal schedule. Unfortunately, some of us enjoyed our vacation a little too much… Another change is just temporary, but requires adjustments to be made, as Brian is traveling abroad and we all miss the head of the family. While change has come, I know that more change will come. I am content with how things are and don’t really want any more change, but life is full of surprises – good or bad. Pain hurts. Seeing those you love in pain is itself painful, and it’s even worse when you cannot do anything to ease their pain. I don’t like to sit by and not help when help is needed. But sometimes there is nothing that I can do to help and even my prayers feel weak and wasted. There are too many hurts in this world that I cannot fix and cannot help make better. I know that God is big and mighty and good. I know that one day He will take away all the pain, but right now it hurts. There are a few blogs that I follow regularly and enjoy reading about how other people live life and whatnot. Usually, I get some good ideas for things to try at home or a little laugh, but today I was a little surprised when I visited one of these blogs. After reading the entry announcing her divorce, I skimmed through the comments, which I only do occasionally, and with over 250 comments I expected at least one negative comment. I didn’t see any. Most people were appropriately very sympathetic and apologetic over the end of her marriage. Many people shared that they have walked that road. This is all very nice, but what shocked me was the number of people who said “Congratulations!” or “Good for you!” There were lots and lots of comments encouraging her in having made a good choice to walk away from a marriage that had grown cold. Not one comment challenged her to fight for it or get some help or anything like that. I know that divorce is common and even acceptable in our culture, but it hurts and it isn’t right and while she acknowledged that in her post, she is just giving up and that shocks me and saddens me immensely. It also makes me even more grateful for my amazing husband and the marriage that we have, while not a picture perfect love nest all the time, we love each other and more so all the time. In the past few months, both of my grandfather’s health declined significantly, they were both suddenly and unexpectedly in the hospital where they received bad news and were released to nursing homes. Tomorrow is the second funeral in less than 3 weeks for my family. My sadness comes in waves and peace usually follows quickly as I know that they both had long, full and happy lives and leave a great legacy behind. I feel like I was able to say goodbye to each of them before they got really sick and I have so many good memories with them. While I’m grieving the loss of my granddads, I’m relieved at their deaths as it means an end to the pain and confusion that they were each experiencing. Pop and Grandpa were completely different men, but both are loved dearly. Helping my children process these losses has been really healing for me. Eila went to bed crying and when I asked her what was wrong, she replied “I’m sad because I won’t get to go fishing with Great-Grandpa ever again.” Since I could do nothing else, I hugged her, cried with her, and listened to her. Then, I suggested that we pray together. That prayer was exactly what I needed. Yesterday, Josiah was nearby when Grandma Karen gave me a hug and condolences. He stated simply “Pop died.” Grandma responded “That’s sad, isn’t it?” And, Josiah said “No, it isn’t. He’s happy with Jesus now.” And that’s the truth. Thanks to my friend Cheryl, I started reading Angie’s blog, about the pregnancy and loss of their baby girl, Bring the Rain and loving the song by Mercy Me of the same name. This summer the Bible study that has been selected is about suffering. I have so many things to be thankful for and cannot think of anything at all to complain or even want. Yet, with this great season of plenty and joy, I can’t help but wonder what is around the bend. Whatever it is, I know that I serve a great God who loves me and will provide no matter what happens, but still I wonder and hope that it’s just the pessimist in me that is even questioning. Every time I turn around, I hear about someone else who is dealing with some horrible situation. The problems range from spousal abuse to sexual infidelity to freak accidents to drugs and addictions to hopelessness and depression. It is sad and scary to hear about friends who are dealing with such serious issues – that really hurt. I was thinking about what I could and should do to help. First, I’m praying for them and for real and lasting change in their situations. Also, I’m trying to be a friend, whether that means listening or watching kids or providing meals or money or a safe place – whatever physical needs I can meet, I will. And, then I realized that I could provide some resources for help. I enjoy researching and so it makes sense that I would find the help that others have already provided and point those who need it in that direction. In my opinion, the best source of info is always the Bible and talking with God!